Nothing is worse than making plans to go out with your family and the weather is bad! But don’t fret. Make rainy days fun and exciting by setting up your Octopit USA gaga court indoors! 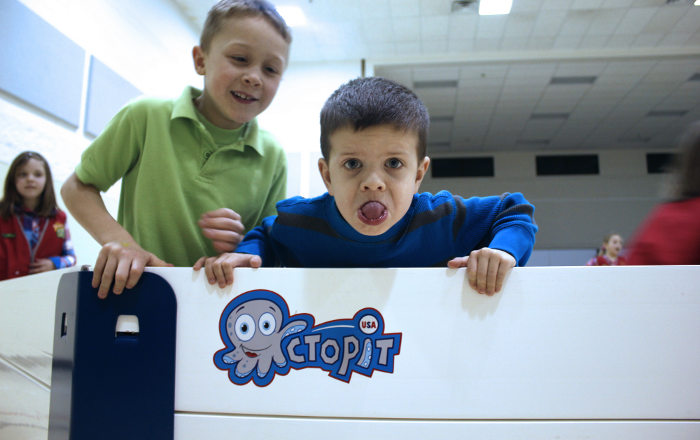 The Octopit is a versatile and portable gaga pit which makes it easy to set up wherever you want! Don’t let your kids mindlessly watch movies, play video games or sit on the computer for the entire day. Instead engage them in the fun and fast pace game of gaga ball. This game is ideal for kids of all ages because while some of the rules are similar to dodgeball, it is not as intense or dangerous. Stay active with your kids despite the bad weather and have a blast doing it! You will create priceless memories laughing the day away and create stronger bonds with your loved ones. Customize the game to you and your family’s own preference! Although there are certain set rules for gaga ball, there are many variations and the game allows you and your family the freedom to make your own rules. Make it even more fun by thinking up silly rules together! Don’t let a rainy day be a wasted day ever again with the best gaga court design on the market. Turn off the TVs and video games and order an Octopit today! Visit us at OctopitUSA.com to learn more.